Hi there – welcome to the fourth day of our self care advent calendar. So now you should be dressed, clean, well fed and have ventured outside. Keep it up – every day – yep, I said it, every day. But here’s one that you can do for just one day (sort of). I want you to make a December/Christmas bucket list. If you celebrate Christmas this is a great idea to make sure you are getting the most from the holiday season. If you don’t celebrate Christmas you can still join in by creating a list of all the things you want to do this December. I want you to make your own, but I’m going to give you mine so that you can use it for inspiration. So as I said – this one is a one off. You just need to do all the things on it, and that could take all month! Only put things on the list that YOU want to do – don’t try to fit into anyone else’s expectation of what you should or shouldn’t be doing. It’s your list. Also whilst I would love for you to do all the things on your list, you may not get them all done, and that’s OK – there’s always next year, or maybe you could just extend it into to January….it’s all flexible. It’s your list, your life and your experience – do it any way that works well for you. Having said that, it there is something that you’ve put on your list that you never get round to doing, ask yourself why. Is it because you didn’t really want to do it in the first place? Or maybe you do want to do it but can’t quite fund a way to make it happen…If that’s the case you need to make a plan and make it happen. Your Life if Your responsibility – make the things you want to happen happen. So go forth and get on with your amazing Christmas Bucket List. Sometimes we can all do with a little helping hand to get us moving. If you need help with motivation or planning, maybe you could use the help of a therapist or life coach. We’re out there and happy to get you where you want to be. Would you like to help a child who doesn’t have shoes? Well, today is no shoes day, and you can help – for free! It’s a day where you are asked to abandon your shoes to focus your mind on the millions of people around the world who don’t have the luxury of having shoes. Forget about a home, with heating or air conditioning. Forget about a computer. Forget about alcohol, caffeine, convenience food or fresh fruit. Forget about fashionable clothes, designer gear or clothes with the right label. Millions of people don’t have shoes. Insect bites or small cuts are particularly dangerous on feet as the chances are the people with no shoes are not walking in the most sanitary of conditions. The open wounds mean that they can pick up infections that become ground into the the feet. This can be life threatening. A lot of these people will be children. Children struggling to survive by scavenging through rubbish tips. Can you imagine having to go through other peoples rubbish in order to find some scraps that you can sell so that you can eat? Now imagine doing it with no shoes on. Scrabbling through broken glass, twisted metal and filthy needles. If you think this is a good idea, share it. Repost it. Write your own post about it. Sometimes making changes in our life can feel overwhelming – it’s just too much. Too hard to make permanent changes, even if we know that changing will make us happier, healthier and feel better. So why not try it just for a day? It’s a technique that people who are in recovery from an addiction know pretty well – one day at a time. It might seem incomprehensible to an alcoholic that they will never drink again. An idea of a lifetime of sobriety is just too overwhelming to consider,but a day, or an hour or even a minute may be doable. After one minute, maybe I could do one more. After one hour, the next may seem more possible. After a day, I can try another day. Success can often lead to more success, so sometimes it’s better to make small goals. It’s a great strategy for an addict. So ask yourself what you are addicted to. Are you hooked on self defeating attitudes? Can you go through a day without beating yourself up about something? Not all of the suggestions below will apply to you – maybe none of them will, but maybe, just maybe you’ll find something below that you could try – Just for today. Just for today do something you want to do, but normally don’t let yourself. Eat the forbidden food, watch the trashy TV, say the thing you’ve been wanting to say. Just for today do something that you know you should do, but can never get started with. Just for today give yourself permission to feel how you don’t normally feel. Have a day where you stop worrying, decide that you like how you look or stop putting others first. Just for today allow yourself to be totally in the moment. Turn everything off. Sit quietly and notice your thoughts. Just for today drink nothing but water. No caffeine, no sugar, no additives, no alcohol. Just for today be honest with yourself. Stop making excuses, stop lying to yourself, ask yourself the difficult question. Just for today forgive yourself. It’s OK not to be OK. You’re human, not perfect. Just for today don’t complain. Think about what you’re grateful for, think about those worse off than you, think about how lucky you are. Help your family, help your friends, help a stranger. Just for today be kind. Be kind to yourself, be kind to those you like, be kind to those you don’t like. Let go of the anger, let go of the hate, let go of the pain. New tastes, new activities, new strategies. There are many things that we could all change in our lives. Sometimes they are easy, sometimes they are hard. Why not try them on for a day – you never know, you might like it. If you do, maybe try it for another day,and another, until it’s just what you do now. If you find it hard to change things in your life, there are ways that you can make it easier. My favourite is hypnotherapy, but others are available. Try change on your own, but if at first you don’t succeed, don’t give up, get some help. In Hypnotherapy I often ask people to think of a perfect place – a place where they can feel safe and comfortable, a place where they can be entirely themselves. I ask them to think about where it is, what it looks like, what it feels like, what the light is like, what smells they can smell and what sounds they can hear. It’s good to have a perfect place. It reminds me of this song I used to love as a teenager. Still do actually. 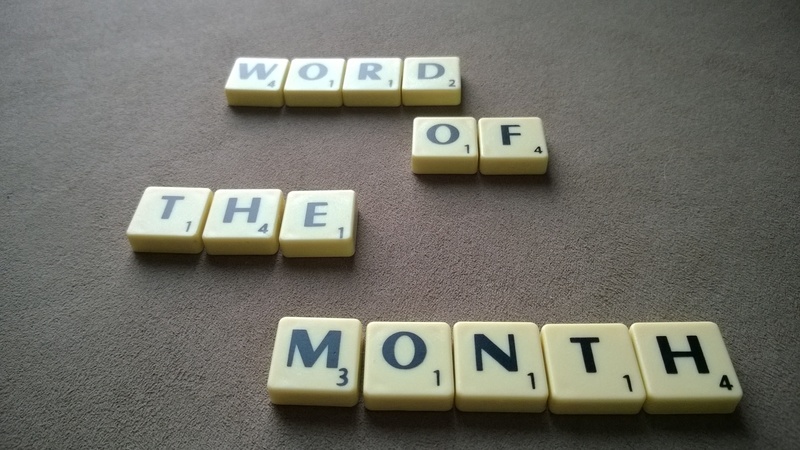 My word for March is Magic. A lot of what I read is about magical things. Fairy tale worlds of science fiction and fantasy. I’m currently reading Skin Game by Jim Butcher about a wizard in Chicago. It’s ace. I practice magic a little. As a hypnotist I help people to make magical transformations in their lives. I’ve also learned a few card tricks along the way. I like fantasy and fun, I like tricks and trickery, I like things that astound and amaze. I sometimes get told that I have a childlike quality. I choose to take that as a compliment. I believe you can find magic everywhere if you are willing to look for it. My idea of what is magical may have changed as I have gotten older, but my love of it hasn’t faded. Now I can be amazed at what people can do in science and technology. I can be astounded at how much people do to help and support others. I can be thrilled by seeing the changes that people achieve. Be a kid, see the magic and find a way to be amazed today. She’s an old girl now and she takes pain killers for her joints and walks slower than a slow thing. Today we travelled a little further afield. I am very proud of my partner who is raising money for Mental Health by completing the 3 peaks challenge – that is climbing the 3 largest peaks in Scotland, England and Ireland in 24 hours. To support him on his training, Flump and I accompanied him on a walk to Burton Dasset – more hills than mountains, but still a good bit of exercise. I admit to being concerned about taking Flump as she struggles with long walks and steep slopes, but we decided to see how she went. she put me to shame. She bounded up slopes, straining at the lead. then bounded back down them again, looking for the next place to go. She walked, ran and climbed for an hour before we took her back to the car where she slept the sleep of a very contented pooch. All the time I had been blaming her weariness on her age, but I think she was just bored. She went on an adventure and she was like a puppy again. and find your inner puppy. We are now in Lent – the period that one is supposed to give up something we enjoy for 40 days and nights – until Easter. It kicked off yesterday with Pancake day or Shrove Tuesday where it is traditional to eat pancakes as this was seen as the final feast before the fasting of Lent. Today it is very rare to fast for 40 days and nights, whatever your religion or faith system is based on, but is there any benefit to this ancient practice. Proponents of the 5-2 diet where you eat drastically reduced calories (500-600) for 2 days a week will tell you that fasting is very good for your body. It reduces the chances of strokes, heart attacks and diabetes but I don’t think any of them would advocate a prolonged fast which would be much more likely to have a negative effect. So how about giving up other stuff? Well if the thing you are giving up is intrinsically bad for you, such as smoking or self harming in some way, then that would be a good thing to do – and to keep up way past Easter. What if the thing you are giving up isn’t exactly good for you, but isn’t necessarily bad either, like chocolate or the odd glass of wine. Well, again there appears to be a benefit. Showing a level of self denial or will power helps us to achieve the things we want in life. Psychologists believe that in some ways will power is like a muscle – you have to use it regularly to keep it strong. How about giving up something you don’t like – for instance worrying or getting upset by things. Giving those up for a while could leave you feeling brilliant! If you haven’t already given something up for Lent – why not set yourself a little challenge and see how you do? You could even get people to sponsor you and raise a little money for charity. Go on – Give it up! Do you ever have one of those days where everyone annoys you? From the person calling in to the TV show, to the person who has parked awkwardly at the supermarket, the person who wanted to stop to chat and the person who didn’t. I was having one of those days earlier. Weirdly the thing that snapped me out of it was someone being genuinely obnoxious. If I had been in my normal happy go lucky kind of mood they may have irritated me, but I was already in a foul mood (for no good reason at all) and they made me laugh. Now, I knew from the outset the the problem today was me – I was the one with the issue – not everybody else, but it never really feels that way. It was only when I was confronted with someone who was at fault that I could let go of the anger I was feeling to everyone else- because they all looked so good in comparison! How often are we happy or unhappy with a situation just because we have compared it to others? If you walked into work tomorrow and the boss called you into the office and told you he was giving you a 10% pay rise, you would probably be pretty pleased. If you later found out that everyone else had been given 15%, how would you feel? You still have the 10% raise that you were happy with, but now it just seems unfair and a bit rubbish. On the other hand if you found out everyone else was only getting a 5% raise, your 10% would feel even better…even though it’s still the same 10%. So, If you want to change the way you are thinking or feeling, try to do some comparisons that will make you feel good. There are always people who have it worse or harder than you do and there will always be people who have it better. If you are constantly comparing yourself to those who have what you perceive to be a better time of it, you will leave yourself feeling fed up and hard done by. Compare yourself to the ones who have it worse off and you will elevate your mood. You might even decide to do something to help them, which will make you feel even better (research shows that people doing a good deed get more from it than the people to whom a good deed is done).